2019 Kiddie Parade is Friday, June 14th. 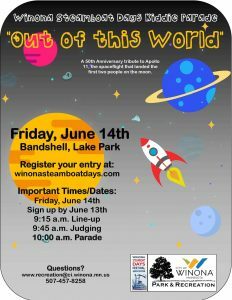 The 2019 theme is “OUT OF THIS WORLD”. Please sign up by Thursday, June 13th. 507-457-8258 or [email protected] for questions. $1 Hotdog, chips, and drink. Monies raised goes to Friends of the Library. Groups of five or more can preorder meals by calling Winona National Bank at 454-8800.